On November 20, 2018 in a computer class of Software department of the Karaganda state technical university a master class for undergraduates of department in the subject “Methodological Bases of Scientific and Engineering Creativity” took place. 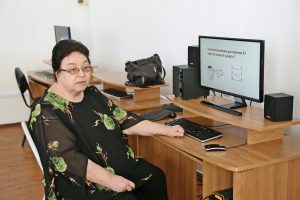 Occupation was organized and held by Software department together with the foreign scientist invited in the university: Doctor of Engineering, professor Irina Yu. Petrova (Astrakhan, Russia). 1) Introduction to engineering activity. Laws of development of technology and technological ways. 2) Naukometriya, key indicators of printing activity of the scientist and organization, indicators of rating of scientific magazines. 3) Electronic information resources for science and education (the international systems of citing). Prof. Irina Yu. Petrova in detail told about Scientometriya and Scientometric databases (Web of Sciences, Scopus, SCImago, E-Library, etc. ), explained concepts of Scientometric indexes (the Hirsh index, an impact-factor, etc.) for the purpose of formation of culture of thinking and practical application when writing master theses. Undergraduates actively expressed the personal opinion about development of technological ways in the world, in Russia and Kazakhstan. They are asked questions of how to pick up the magazine for the first publication what has to be structure of the scientific article as it is correct to make out the bibliography to article and the thesis. Irina Yu. Petrova transferred to Soft department the methodical instructions on carrying out a practical training on a research of printing activity of the certain countries and regions, the universities and scientists.